Page 8 1101 shop online at www.broadcasteronline.com Announcements - 1101 Events Driver Licensing Schedules: Vermillion 7a.m.-5p.m. Thursday & Friday; Yankton 7a.m.-5:30p.m. Tuesday, Thurdsay & Friday; Elk Point 8:30a.m.-4:30p.m. 1st & 3rd Wednesday; North Sioux City 8:45a.m.-4:30p.m. 2nd, 4th & 5th Wednesday. Call 1-800-952-3696 or visit www.state.sd.us/dps/dl for more information. EMPOWERING YOU to take back your life. The Women Rising Support Group meeting weekly. Childcare is available upon request. Call 624-5311 for details. FAITH LUTHERAN CHURCH: 401 Main Street, Makell, NE. Worship: Fall Hours, 10am. Sunday Schools 9am PMA Chad Beckius, (605)658-0240 (home) (402)-692-3323 (church). ST. AGNES Church, 416 Walker St., Fr. John Fischer: St. Agnes Church and Parish Office, tele. 624-4478. St. Agnes Rectory, 505 Catalina, tele. 624-1995. Mass schedule: 5 p.m. Saturday, 8:00 a.m. and 10:30a.m. Sunday, Weekday Masses – consult weekly bulletin; Sacrament of Penance, Saturday 4-4:45p.m. PRECISION PAINTING A17407 Announcements - 1101 Events Faith United Lutheran Church, ELCA, 44874 303rd St/Po Box 168, Volin, SD 57072, (605)267-2277. S u n d a y Worship: 9:30am with Holy Communion the 1st & 4th Sundays. WOW Wednesday program beginning at 6:30pm for all children 3 yrs old - 7th grade, and confirmation classes for those in grades 8th & 9th. FIRST BAPTIST Church Elmer “Sandy” Aakre, Pastor 624-6391 home, 624-4658 church. Time: 9:15 Sunday School, 10:30 Worship. Sunday Choir Practice, 11:50 a.m. Gamblers? Anonymous will be meeting weekly on Tuesdays at 7 p.m. at the Vermillion Public Library in the meeting room. GAYVILLE LUTHERAN Church: Sunday School 10:15 a.m., Worship 9 a.m. Pastor Ralph Egbert. GOSPEL CHAPEL Church, 708 Jessie St./Highway 12, Newcastle, NE. Sunday School, 9:30 a.m.; Sunday worship 10:30 a.m.; AWANA Wednesday at 7 p.m., 402-355-2305. Pastor Chuck Myers, 402-355-1335. Announcements - 1101 Events GRACE BAPTIST Church, SBC, Pastor Steve Ford, 1102 E. Main. Phone 624-4949. Adult?s and Children?s Sunday School 9:30 a.m. Sunday Worship 10:45 a.m. Prayer Meeting Wednesday Night 7 p.m. PROVIDENCE REFORMED Church, 830 Madison: Sunday School 9:30 a.m., Sunday Worship 10:30 a.m. “We Welcome You To Historic Protestant Worship And Fellowship.” Is food a problem for you? Does weight affect the way you live? Overeaters Anonymous meeting in Vermillion, Thursdays at 6:30p.m., Sanford Vermillion Hospital, 20 South Plum. (Administration door south of hospital entrance in small conference room.) REACH 2 MILLION HOUSEHOLDS! Do you have a product, service, or business that would be helped by reaching over 2 million households throughout Iowa and the surrounding states? The Midwest Classified Network will allow you to reach these potential customers quickly and inexpensively. For more information concerning a creative classified ad call this publication or Midwest Free Community Papers at 800-248-4061 or get information online at www.mcn-ads.com (MCN) KOMSTAD COVENANT Church, Rural Beresford and Centerville, SD: Matt Styles, Pastor. 18 miles north on University Road. Phone 563-2402. Sunday School 10 a.m., Worship Service 11 a.m. Meckling School All Class Reunion at Toby?s, Thursday, July 21, 2011 at 1:00pm. ST. PAUL?S Episcopal Church, corner of Main and Linden. Sunday: nursery available. 10:00 a.m. Holy Eucharist. 11:00 a.m. coffee hour. Call 624-3379 for more info. The Rev. Rita Powell, priest. Narcotics Anonymous, Thursday Night Live, meets every Thursday at 7:30pm at Trinity Lutheran Church. Use back entrance, Rm. 14. Unitarian Universalist "The Uncommon Denomination." Services are the first and third Sunday of each month at 7 p.m. in the basement of the United Church of Christ, 226 E. Main. Child care services and refreshments provided. All welcome. Info: www.unitarianvermillion.blogspot.com INTERIOR • EXTERIOR COMMERCIAL • RESIDENTIAL Quality Workmanship, Reasonable Rates Since 1983 CLINT TUCKER • 624-4621 Announcements - 1101 Events PLEASANT VALLEY Lutheran Church, Rural Vermillion: Sunday School 9:45 a.m., Worship Service 10:30 a.m., Holy Communion First Sunday of every month. All welcome. IMMANUAL Lutheran Church, Elk Point, SD: Worship Service 9:00 a.m., Sunday School 10:00 a.m. Book one of our two VEGAS style limos for a night out on the town. Call Jeff (605)661-1615 www.specialdaylimo.com ice 1/2 PrSandal SALE! Men’s & Women’s Minnetonka Great Selection To Choose From! 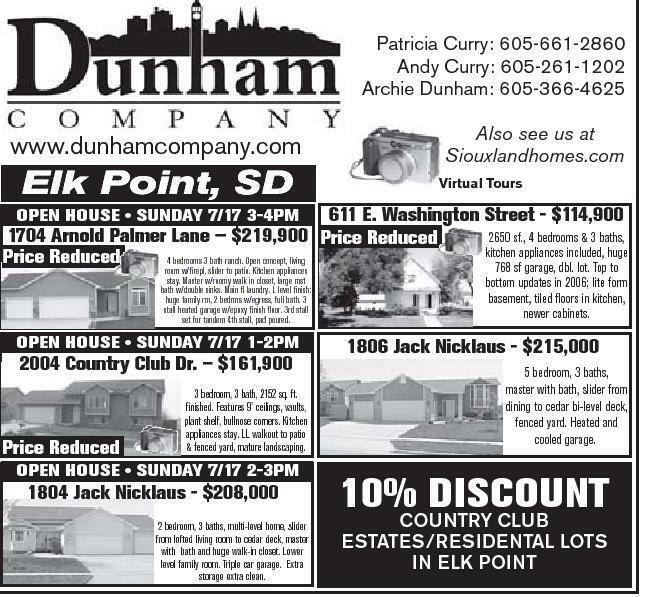 Boston Shoes• 665-9092 to Boots 312 W. 3rd • Yankton Patricia Curry: 605-661-2860 Andy Curry: 605-261-1202 Archie Dunham: 605-366-4625 Also see us at Siouxlandhomes.com www.dunhamcompany.com Elk Point, SD Virtual Tours 611 E. Washington Street - $114,900 2650 sf., 4 bedrooms & 3 baths, 1704 Arnold Palmer Lane — $219,900 Price Reduced kitchen appliances included, huge Price Reduced 4 bedrooms 3 bath ranch. Open concept, living 768 sf garage, dbl. lot. Top to OPEN HOUSE • SUNDAY 7/17 3-4PM room w/firepl, slider to patio. Kitchen appliances stay. Master w/roomy walk in closet, large mst bath w/double sinks. Main fl laundry. L level finish: huge family rm, 2 bedrms w/egress, full bath. 3 stall heated garage w/epoxy finish floor. 3rd stall set for tandem 4th stall, pad poured. OPEN HOUSE • SUNDAY 7/17 1-2PM 2004 Country Club Dr. – $161,900 Price Reduced 3 bedroom, 3 bath, 2152 sq. ft. finished. Features 9’ ceilings, vaults, plant shelf, bullnose corners. Kitchen appliances stay. LL walkout to patio & fenced yard, mature landscaping. OPEN HOUSE • SUNDAY 7/17 2-3PM 1804 Jack Nicklaus - $208,000 2 bedroom, 3 baths, multi-level home, slider from lofted living room to cedar deck, master with bath and huge walk-in closet. Lower level family room. Triple car garage. Extra storage extra clean. July 12, 2011 bottom updates in 2006; lite form basement, tiled floors in kitchen, newer cabinets. 1806 Jack Nicklaus - $215,000 5 bedroom, 3 baths, master with bath, slider from dining to cedar bi-level deck, fenced yard. Heated and cooled garage. Announcements - 1101 Events Sunday evening Experience at ONE HOUR is comprised of two primary elements: powerful worship and a life-changing message. Worship at ONE HOUR is led by a talented live band in a style that is consistent with todays culture and a relevant teaching message from LifeChurch.tv?s senior pastor, Craig Groeschel, via video broadcast. The worship is intense and the teaching is challenging but the environment will be relaxed and casual. ONE HOUR on the USD Campus at the MUC, 6:30pm Sundays! www.one-hour.org Announcements Events The USD Luther Center, where church and flip-flops go together! The Luther Center, at the corner of Cherry & Plum, Vermillion, has weekly worship services on Wednesday evenings at 7p.m. and 5 Alive meal and devotional gathers on Sunday evenings at 6p.m. during the school year. Pastor Kevin Jensen, 605-624-2834 The Vermillion First United Methodist Church, a welcome place reaching out to all God?s people. Located at 16 N. Dakota St., Sunday School 9:15am, Worship 10:20am. Call 624-2179 for more info. Pastor Brook R. McBride. HELP WANTED 1400 Services 1335 Other Employment PREGNANT AND AFRAID? C a l l Birthright 665-5580 (Yankton); 258-3436 (Sioux City); 3348 4 1 1 (Sioux Falls); 1-800-550-4900 ( t o l l free). AIRLINES ARE HIRING Train for high paying Aviation Career. FAA approved program. Financial aid if qualified Job placement assistance. CALL Aviation Institute of Maintenance 866-231-7177. (MCN) 1315 NOW HIRING! Great FAT Summer Job. Live, Work, Play In Major Cities & Resort Areas. Daily Cash, Transportation Provided. Apply Now! Ashley: 1-877-503-5330 (MCN) Drivers DRIVERS-OWNERS-LEASE PURCHASE: Earn Up to $4K A Week! Midwest Runs, Off Each Weekend, Miles/ Money, 1000 Sign-On Bonus. Apply Now! 1-800-494-3532; www.NorthAndSouthExpress.c om (MCN) TRUCK DRIVERS WANTED Best Pay and Home Time! Apply Online Today over 750 Companies! One Application, Hundreds of Offers! www.HammerLaneJobs.com (MCN) 1330 Professional Employment A Career Sales Opportunity Do you desire higher pay, flexibility and better benefits? Travelers Motor Club is looking to develop 2-Sales Representatives/managers in the Wagner, Vermilllion, Yankton- Norfolk, Wayne, Crofton areas. We offer: First year W-2 income exceeding $55,000, Excellent benefits and Retirement plans plus leads., Advancement/Residual Income. Dean Koehn (605)261-6081. Now Hiring-Motel Manager in SE-South Dakota. Please apply at PO Box 423, Vermillion-SD 57069 or e-mail gmjob2011@gmail.com. 1360 Income Opportunity Investors-Outstanding and immediate returns in equipment leasing for frac industry. Immediate lease out. Tax benefits and high returns. We need more equipment! 817-926-3535. nani Call Classifieds 624-4429 10% DISCOUNT COUNTRY CLUB ESTATES/RESIDENTAL LOTS IN ELK POINT L&M Radiator Worldwide manufacturer of heat exchangers for off highway equipment has several openings for the following positions: EQUESTRIAN | COMMERCIAL | AGRICULTURAL | GENERAL PURPOSE Style & Quality From Concept to Completion For over 60 years we’ve been constructing functional, attractive buildings. 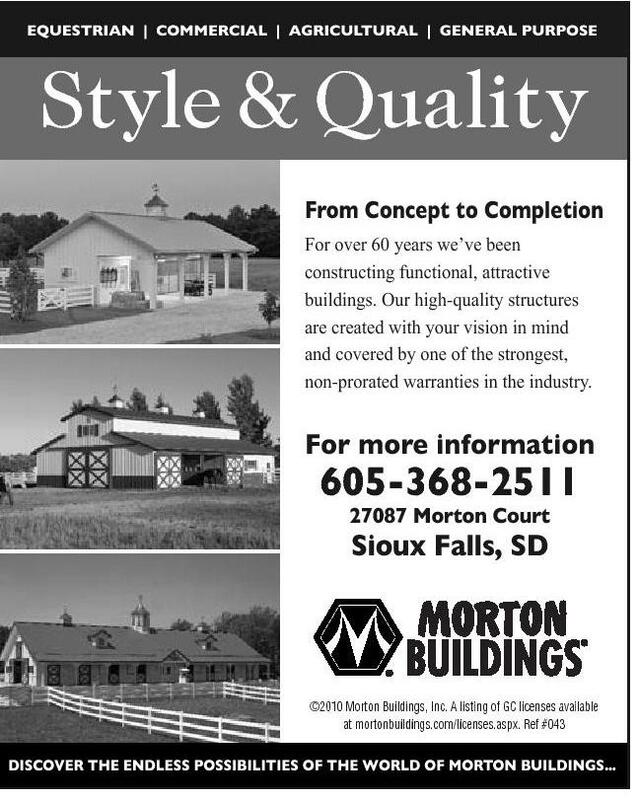 Our high-quality structures are created with your vision in mind and covered by one of the strongest, non-prorated warranties in the industry. PRODUCTION ASSEMBLY Strong mechanical ability with at least 1 year of related work experience. Ability to operate machinery necessary. Ability to use power tools and forklifts necessary. Blueprint reading a plus. TUBE MACHINE OPERATORS Strong mechanical ability with at least 1 year of related work experience. Ability to operate machinery necessary. WAREHOUSE For more information 605-368-2511 27087 Morton Court Sioux Falls, SD ©2010 Morton Buildings, Inc. A listing of GC licenses available at mortonbuildings.com/licenses.aspx. Ref #043 DISCOVER THE ENDLESS POSSIBILITIES OF THE WORLD OF MORTON BUILDINGS... Warehouse position with 1 year related work experience in warehouse for midnight position. Excellent benefits. Competitive wages and a full benefit package. Ability to use power tools and forklifts necessary for ALL positions. L&M Radiator, Inc. No phone calls. 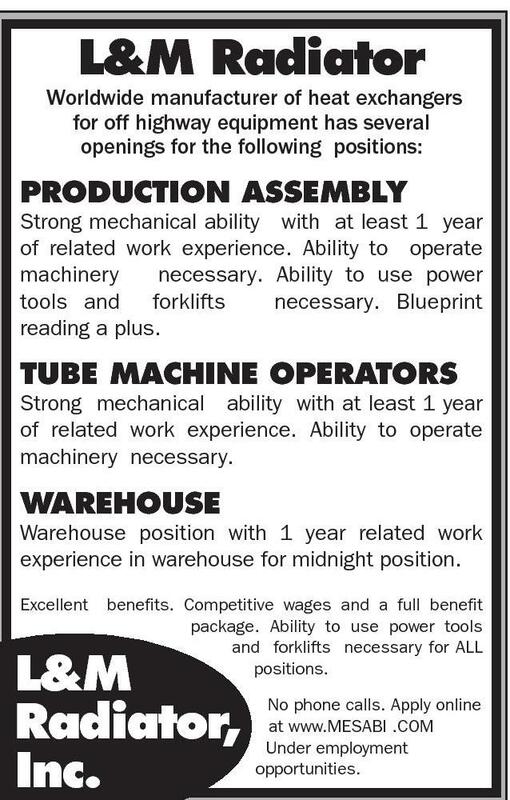 Apply online at www.MESABI .COM Under employment opportunities.